Happy Friday! For once, I feel like this Friday is a weekend day; it feels great. I have two days off work and finally have a minute to take a breath and relax. I went to lunch with my roommate yesterday at a new restaurant called Jawaiian Irie Jerk Restaurant. It used to be a food truck, and was so popular that they turned it into a restaurant. Pretty cool story; definitely has added a little to my dream of owning a food truck! On another note, this friday we have a great guest blogger from the mainland; please welcome Kimby from A Little Lunch! Hi! I’m Kim (aka Kimby) from A Little Lunch and I’m pleased to be visiting with y’all at Savour The Senses. When I started blogging last year, I had no idea I’d be hanging out with Jenny in Hawaii (on her blog) less than a year later — simply amazing. Thank you, Jenny! Good times! Besides blogging, I enjoy cooking and writing in general, as well as photography. Blogging allows an outlet for all three, plus it it connects me with a fantastic group of folks. I love reading your thoughts, ideas, and recipes! In trying to figure out which one of mine to share, I decided on my favorite sponge cake, dressed up with a fresh lemon sauce. The color and flavors remind me of Spring! Even Oklahomans get anxious for winter to be over. 🙂 Hope y’all enjoy this taste of Southern springtime, and thanks again, Jenny, for inviting me into your sunny home! Preheat oven to 325F. Lightly grease a 9" round cake pan; set aside. In a large bowl, beat the eggs for 2 to 3 minutes on high speed until they're pale yellow. Add the sugar; beat again. Add flour and baking powder; mix until combined. Add milk and vanilla; stir until blended. Pour batter into prepared pan. Bake 25 to 35 minutes at 325F until a pick inserted in center of cake comes out clean. Cool (in the pan) on a wire rack for 10 minutes. Remove cake from pan and cool completely. (If necessary, run a sharp knife around the edges of the cake first before removing from pan.) While it cools, prepare the sauce. In a small saucepan, mix together sugar, cornstarch and salt. Gradually whisk in water. Cook over medium heat until mixture is clear and bubbly. Remove from heat. Stir in lemon juice, lemon zest and butter until blended. Serve warm over sponge cake. Thanks so much Kimby! This sounds like a perfect light dessert (or even breakfast haha)! If you or somebody you know would like to be a part of Featured Foodie Friday please e-mail me at savourthesenses (at) gmail (dot) com and we can get you scheduled! 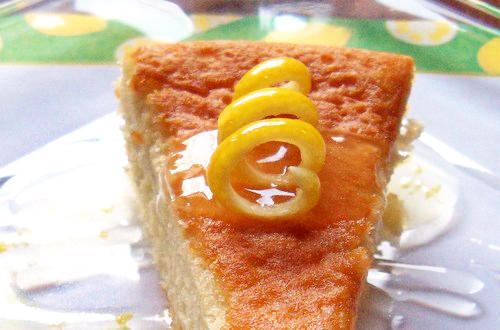 Very lovely recipe, especially because of that lemon flavour.. It surely shows that a place has great food, when it transforms from a food truck into a restaurant! Lovely tasty spongecake, I wouldnt mind a bite with your lemon sauce Kim. Love the new blog design – very fresh and light! Glad to see Kim guest posting here, she did bring a tasty bit of sunshine with her! Citrus is something I enjoy all year round, even in winter. No doubt this is a delicious one, a sauced slice of cake does sound like a great diversion from the frosted ones. Enjoy the weekend! I’m a sucker for anything lemon. 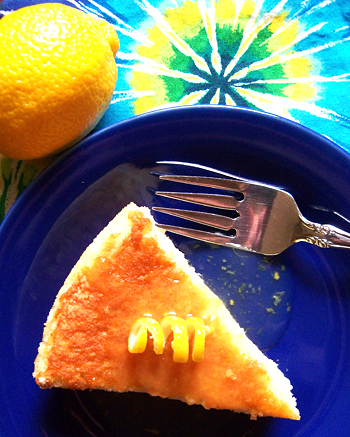 I love the tart taste and this cake looks and sounds just like it’s for me! Fabulous recipe! My neighbor has a lemon tree just begging me to come pick a few, now I know just what to do with them! Beautiful photos too, I will be a new subscriber to Kimbys blog too! Thanks, I like it a lot more! Ooooh … my cheeks are puckering just looking at this! Fresh! So refreshing! I’m definitely awake now … and drooling. It looks perfect and I’m SO ready for the warmer weather….Hawaii sounds perfect right about now! Have a great relaxing weekend! I would love for you to own a food truck so I could do some vicarious living through your experiences!!!!!!! Great guest post and scrumptious looking cake. Excellent presentation! Thank you, Medeja! I appreciate you stopping by my guest post here at Jenny’s. Enjoy! Hello, Helene! Jenny got me curious about owning her own food truck — we definitely need to hear more about that. 🙂 Thanks for your kind comment! Ann, I’ve been enjoying your London trip highlights on your blog — I’d definitely enjoy hearing a write-up about Hawaii! (Hula, anyone?) 🙂 Thanks for your support! Eliot, I’d stand in line for Jenny’s food truck, too (if only on-line..) Thank you for your comments!